Taking the #8 place on our Top Ten Holiday Gifts for Girlfriends list is that perfect gift for the girlfriend who loves to reinvent, redo, remodel, or be creative with all things in her home. What a better way to find inspirational ideas than with a year subscription to Better Homes & Gardens Magazine. I personally love this magazine, I find so many good creative ideas in it that I have utilized through the year, including all of the awesome holiday ideas. There are quite a few family members of mine that would just adore this gift, because it's a gift that gives for an entire year! I have found the perfect deal for this top ten girlfriend gift. For just $5.99 a year you can get your girlfriend a year long subscription to this amazing magazine, that is $.50 per issue. Not only will you get an amazing deal you subscribe, you'll receive Better Homes and Gardens' All-Time Favorites Cookbook ABSOLUTELY FREE!. To take advantage of the #8 Holiday Gifts For Girlfriends you can click here or on the banner above! Kathy's Calm To Chaos Life #9 on our Holiday Gifts for Girlfriends series takes us my all time favorite beauty store (which will probably be in the top ten more than once) Sephora! Sephora carries a very wide array of beauty products. Everything you could need from make-up to hair and nails. I spend countless hours on Sephora's site weekly looking at all the products. One of my most favorite items are the Sephora Favorites collections. Sephora puts together a collection of their favorite things and offers it up at an affordable price. Their collections gives you a chance to try some higher end beauty products, in sample or travel sizes. These collections are Sephora store exclusives, some of which may be online exclusives while other are also available at the brick and mortar stores. Also included in this wonderful fragrance sampler set is a vouch that is redeemable at a US Sephora stores for you to redeem for your favorite rollerball scent of choice at no additional cost. You can also shop the Sephora store through Ebates and earn cash back on your Sephora online perchases. Right now there is 9% cash back! If you aren't an Ebates member you can join for free here and earn cash back on your holiday online shopping! What can be better than holiday shopping for your bestie all while earning cash back! Disclosure - All opinions expressed are 100% my own. I have no affiliation with Sephora.com. I will receive referral bonuses for new members joining through the above Ebates link. This year I've decided to create a top ten series of the best gifts for girlfriends this holiday season! I've asked fellow girlfriends what they think is the best gift to give a fellow girlfriend along with my person choices of things I both love to give and get, and have compiled the list! Hope my followers enjoy this series and discover the perfect gift for one of the girlfriends! #10 on the list is a coffee and mug set! Having coffee with a girlfriend is not just American, but it's something you see going on all over the world. To me coffee and girlfriends are meant to be together. I love going over my sister's house for coffee and just catch up on the things we've missed in each others lives. 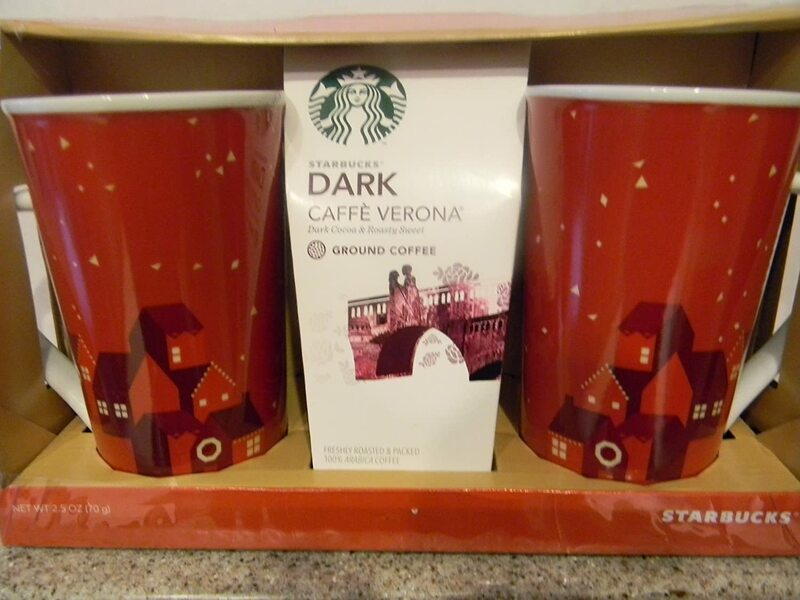 It's these memories and good times, along with follower input that has put the Starbucks Caffe Verona Gift Set Christmas 2013 2 Mug Gift Set into the #10 spot. As you can see the mugs are just so adorable and very holiday-ish with their red color and Starbucks village scene. The coffee is the Dark Caffe Verona blend! Can we say yummmy in a cup! This #10 girlfriend gift can be purchased right on Amazon for $25. It is also Prime eligible which would give you free 2 day shipping! If you aren't a prime member you can sign up for a 30 day trial, which includes Prime eligable purchases, such as this great gift set, free 2 Day shipping. Buy your bestie this cute little coffee and mug set this holiday season! Disclosure - this post is 100% my opinion and in no way is Kathy's Calm To Chaos Life affiliated with Starbucks. I am an Amazon Affiliate member. Braeburns, Fujis, Galas, oh my! Whether they're drizzled in caramel sauce or baked into a pie, apples are an undeniable temptation. And with thousands of varieties grown around the world, there's one -- or two or three -- out there for every recipe. Not sure which to choose? Check out this primer on which varieties best suit your favorite homemade pie, sauce, and salad recipes for a guaranteed flavor burst. Thinking of having your dog join in your fitness routine? Here are some tips to help you and your dog out!